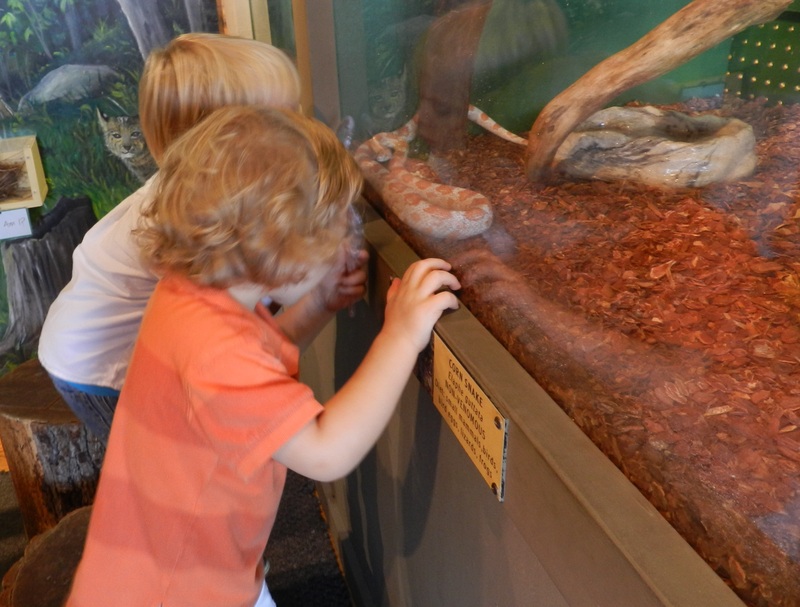 See the Park differently – stop by our Animal Discovery Den to learn about the wildlife that call the Park home. In the Den, you’ll get the chance to see where some of our animal educators live when they aren’t busy teaching and be able to pick up some new animal facts you might not know. 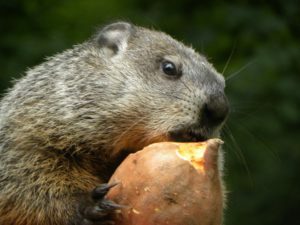 After you’re done exploring indoors, venture out back to see our resident opossum and groundhog in their exhibits. You’re also enjoy our beautiful Lepidoptera (butterfly & moth) garden with dozens of native plant species meant to support our pollinators. 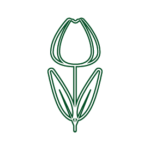 Want a more personal experience? Join us for an Animal Encounters program. Meet the animals and hear how our ambassadors came to live with us and more about the habitat, adaptations and natural history of their kind. These interactive programs are fun for the whole family and are offered at 2 pm every day in April, June-August, holiday and October weekends and Christmas week. 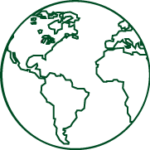 Check out our events calendar for more details. I’m the type of snake found all over North Carolina and can sometimes grow to be 7-feet long. People love me because I do an awesome job of keeping down our rodent (mice, for example) populations. Did you know that rodents can spread lots of diseases to you humans? Good thing I’m around to help you out. If you don’t see me in my home at first, look up. I’m a good climber! 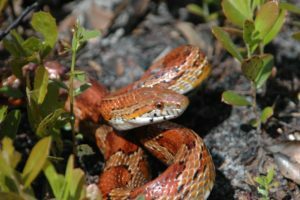 You may not have heard us called this before, but Corn Snakes are also known as Red Rat Snakes. 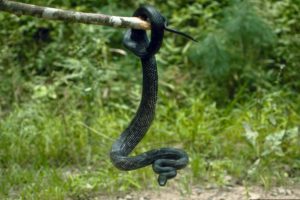 We are very similar to the Black Rat Snake with whom we share our home, but we don’t get quite as long. Folks believe we got the name Corn Snake because we’re often found hanging out in Corn Cribs where lots of mice can be found eating corn. Did you notice that one of us has a normal color pattern while the other is an albino? Albino Corn Snakes are popular in the pet trade. 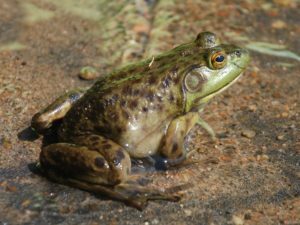 Did you know that Bullfrogs like me eat basically anything we can catch? As the largest type of frog in the United States, we are intense predators. Snakes, turtles and even birds aren’t off the menu for us long-legged amphibians. Please don’t wake me when you come to see me in my exhibit. I like to snooze during the day and be active at night. Don’t let that bumpy skin, long legs and big eyes trick you, I’m not scary at all! Do you know what it took for me to get this look? 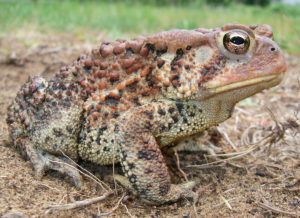 When toads like myself hatch from our eggs, we don’t have legs like you humans. We’re tadpoles swimming in a pond. Over a couple of months, our legs grow and our body is transformed so we can come out on land. Now look at me hop! My tail might make you think I’m a rat, but nope, I’m an opossum. You’ll find out more about who I’m related to on the sign at my exhibit, but make sure you’re polite when you come to see me. Otherwise, I might pass out! 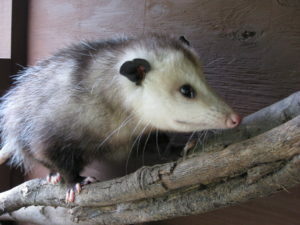 Some people say I’m “playing possum,” but really I get so nervous I faint and can stay that way for up to 5 hours. It’s a helpful trick if you’re getting chased by a predator, but sometimes it confuses people when they find me in their yard! Watch your fingers! No, I’m not an Alligator Snapping Turtle which is what everyone says. Those guys need warmer water. 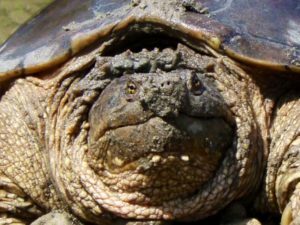 I’m a good ole’ Common Snapping Turtle, but I still bite. It’s not because I eat fingers and toes, but probably more likely because I’m scared. I’m supposed to live in the water, and when I’m there I mind my own business. When I must cross land to find a new home or lay my eggs, I get really nervous and sometimes seem grumpy. Make sure if you’re going to help me cross, you do the “snapper scoot” and use a shovel or other tool to gently help me pass. Yes, yes, it’s us – the longest living turtle in town! Nobody likes to brag, but when you’re the NC State Reptile and you can live up to 100 years, you’re kind of a big deal. Although you may not see turtles like me on your visit today, they’re probably not far from you. 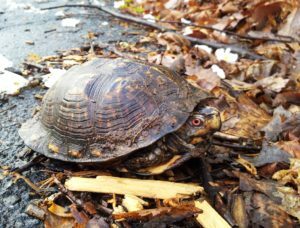 Eastern Box Turtles can be found all over these mountains, but you don’t want to move my friends unless they’re in danger. When we get our mind set on going in a direction, we have to keep going that way. You can help us get where we’re headed, but don’t take us home! If you can’t find us in our exhibit space in the Animal Discovery Den, look for bumps under the dirt. We might be hiding! Why am I standing up on back feet? I’m on the lookout for danger. That’s what groundhogs do when we’re making sure everything is safe around our homes. In the wild I’d be worried about foxes, coyotes or maybe even cars if we live near a road. However, here at the Park, I’m trying to see who’s coming up to visit me. I might be busy digging holes or climbing around, but don’t think I’m not watching! What’s in my cheeks? Seeds! 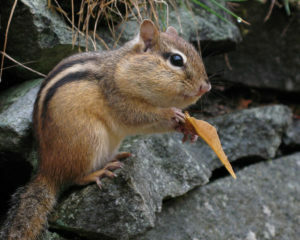 We chipmunks have been designed to fill our faces with extra food so we can take it back to our homes for later. Where is home? Well, you might see the entrance to our houses along the Park’s trails – just a plain old hole in the ground. In the wild we always laugh because people walk by and say “snake hole.” When have you seen a snake digging a hole? Those guys don’t even have arms! In our rocky soil round’ here, it takes a lot to dig a hole. If you catch a glimpse of me in my display, see if my cheeks are full. Watch closely – I’ll scurry to my little house and come out empty-cheeked! Yes, that’s me flaring my head to look bigger than I am, but no, I’m not venomous! 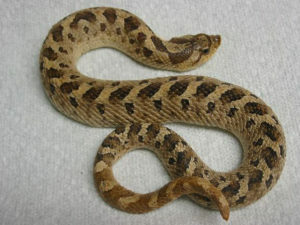 Some snakes, not just Hognoses like me, can try to mimic venomous species to scare away predators. We’re not trying to scare you, but we don’t want to be eaten! In fact, Hognose are sometimes thought to be wimps, because when we are approached by someone who wants to eat us, we roll over and play dead! It works like a charm.